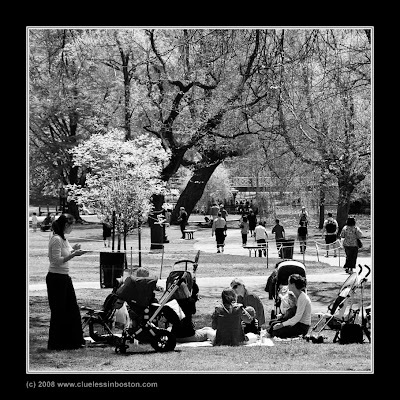 Some women and children enjoying a nice sunny picnic in the Public Garden recently. A mighty fine day for a picnic! Cool shot, must have been a nice day. A modern version of "Déjeuner sur l'herbe". Very nice photo. Oh, and my first thought was "Sunday on la Grande Jatte"! There is a pleasing randomness to the picnickers. Reminds me of a more modern versaion of "A Sunday Afternoon on the Island of La Grande Jatte" by Georges Seurat! I love this! This is a great photo...particularly in B & W.